"This bread is a little sweeter and richer than the usual raisin bread. For best results, soak the raisins in rum overnight and measure the raisins after soaking." In a small bowl, pour rum over raisins. Let stand for 30 minutes and drain. Place ingredients in pan in the order recommended by the manufacturer. Use the regular setting for a 1 pound loaf. Delicious! Very rich, moist texture! The best raisin bread I have ever had, and a big hit with my co-workers! I did this in mini loaves and used in a holiday gift pack of four breads. I'm getting orders from my friends for a whole loaf. They love it. This is a great recipe. I've made this one many time & given it for gifts. Everyone who has tasted it, raves. Wonderful soft texture and light flavor. This was a great bread. It was very moist but not too sweet. I substituted currents for the raisins, they worked very well. Definitely a keeper! 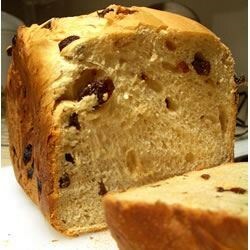 I saved the rum from marinating the raisins and used it in place of part of the water in the bread. Keeps well and stays moist.